For almost five years, ever since I moved to Austin, I have deposited almost every quarter I get in my Superman piggy bank. It filled up. 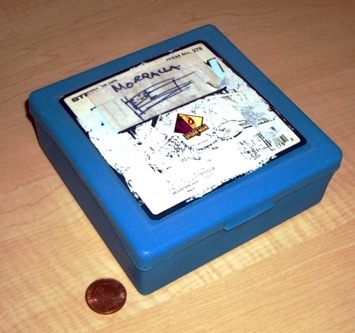 Then, I took Moi‘s little “morralla” (loose change) box (circa 1985) and also filled it up. All quarters. 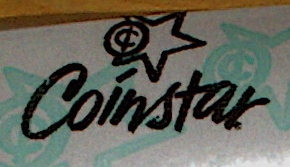 This is where Coinstar comes in. The greedy bastards charge an 8.9% coin counting fee, but you can get, for no fee, an Amazon Gift Card. So I drove to the closest Albertson’s, and spent what were perhaps the most soothing 15 minutes I’ve had in a long time inserting quarters into a machine. Are you wondering how much money I got? Take a guess. 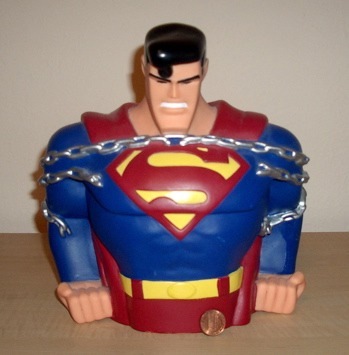 Below are photos of my Superman piggy bank and Moi’s lose change box, pictured next to a penny to convey a sense of proportion. Write in the comments how much money you think I cashed. Whoever is closest to the actual figure will win a cool prize. I’m serious. I don’t know what it will be yet, it depends on who wins. But it will be cool. And no… it won’t be a trip to the moon. Those are still too expensive. Guess how much money I cashed in a Coinstar machine for an Amazon gift card. The best guess (and it has to be within $5.00 USD) wins a prize! (I promise). Read more to see the pictures! Contest ends whenever I say so. Compre su jabon del perro agradecido. Mata pulgas, piojos, larvas y otros indeseables insectos que pueden habitar la sarnosa piel de Canito. No hay necesidad de cambiarle ya su caparazon mas que una sola vez al mes. El jabon tambien ayuda a atenuar su comportamiento impropio ante ojos rasgados y su insaciable deseo por bebidas basadas en cebada . Llevese su jabon y un collar de entrenamiento de electroshocks desfibrilantes por solo 29.95 mas gastos de envio. Llame ahora al 1-800-CA-NI-TO. [Comment for Marcos 4/24/2006:] Good job, “ME” from an Israeli Bezeq IP address… I don’t know who you are and if you win I won’t know who to send the prize to. Feel free to post your identity. My estimate is $347.50, based off of rough comparisons with a box full of quarters and a lot of assumptions. Gave up on the detailed calculations, because unlike some guy I know who spent half of a day estimating the number of M&Ms in a jar, I’ve got to pay my bills! [Comment from Marcos 1/5/2006] That guy was off by 1 m&m! Pingback: The Marcos Kirsch Experience® » Blog Archive » The MKX® Reader Contest: Winner!